How Long Will it Take to Get Flexible for a High Martial Arts Kick? Maybe you’ve decided to take up martial arts training and you’ve taken a class or two. As a beginner, you probably wonder how the more advanced students seem to be able to throw precise kicks to the head seemingly without effort. You can teach yourself to kick efficiently to the head, but it’s going to take dedication and work. 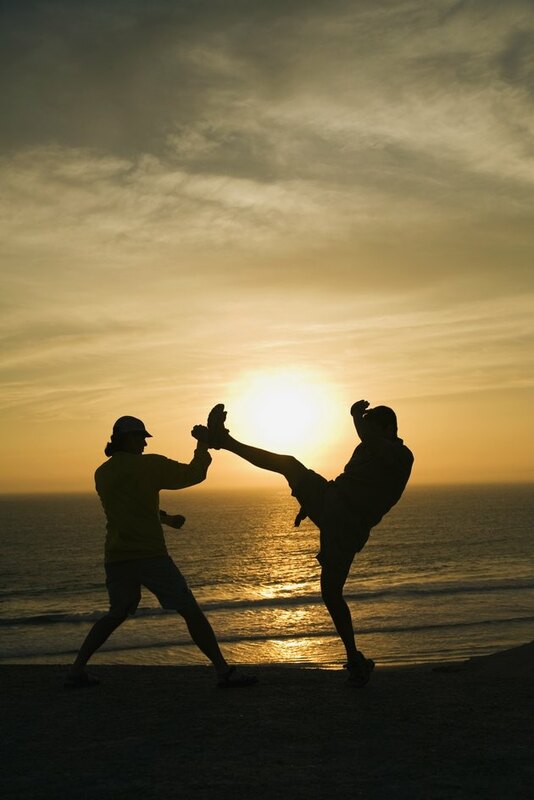 Depending on your level of flexibility and effort, it can take several months to several years to achieve a head kick. If you’ve been sedentary for a significant amount of time, it’s likely that your muscles aren’t used to being stretched. As you begin to train in martial arts, your instructor will probably lead the class in stretching exercises. Learn these stretches and practice them at home. You should stretch for 10 to 15 minutes daily, focusing on the stretches taught in class, since they will help lengthen the necessary muscles for high kicks. Just because you’re a bit tighter than some of the other students in class, it doesn’t mean you can’t perform the kicks. If the instructor is telling the students to kick to the head, he is likely to tell beginners to kick as high as they can. Whether you’re kicking over your head or at knee or waist level, the important thing is that you listen to the instructor and use proper technique when performing the movement. The simple act of throwing a kick with proper technique will help you train your muscles for when your flexibility improves. After a few classes, you’ll likely pick up enough information to be able to stretch and kick at home. Many martial artists throw kicks in front of objects in their homes to help develop the strength and flexibility necessary to perform in class. Spend a few minutes every day practicing the stretches taught in class, but don’t overdo it. On days that your legs are sore, stretch lightly to give your muscles a chance to heal the microtears that develop when training for flexibility. The act of training your muscles for high kicks results in microscopic tearing of your muscle fibers. These fibers will heal themselves in a couple of days, and they will heal in such a way that your muscles are longer and more flexible than they were previously. If you feel a sharp, stabbing pain in your muscles, or hear the sound of a pop, stop immediately and see a doctor. A complete tear in your muscles can require months of rehabilitation. Stretch only as far as you can go without severe pain, and hold that stretch for up to a minute. Take your time and develop proper technique.